I have been playing soccer my whole life (maybe 14 years) and i have never had an injury before. 2 months ago i was finishing my indoor season of, and i went to dive for the ball(am a goalie) and i saw the ball was not going to go in the net, so i backed of my dive. That was a bad idea my knee went in the weirdest position its never been before and i heard a pop. I could not move my leg or anything so they had to call a ambulance and them brought me to the nearest hospital. When in the hospital they did x-rays and said nothing was broken. I was happy. They told me to go to my family docs in a week to find out what was wrong. So in a week i went and he didn't really see anything wrong and said i could play soccer in a week. A week later i played my soccer game, and i went to dive for the ball and my knee hit the ground in pain, but i got up and just went to the side lines. I knew something was wrong so i went to a sports clinic and they said it was hard to tell right away what was wrong but they knew something was wrong. She said i might of dislocated my knee or it could be my acl. So i went to start phyiso the next day and she said i was my acl. 2 weeks later i went back to see the the doc in the sports clinic and she told me it was my acl, so she referred my to see a surgeon. A week later i seen the surgeon and he scheduled my opp in a week. 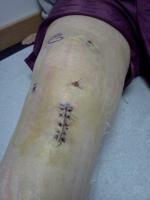 He did my surgery arthroscopicly. After my surgery i don't rember anything just waking up in so much pain. He told my mom that he was surprised how much damage i did. I completely tore my acl, and lcl, and i damaged my menicus. 4 days after my surgery i started phyiso again. Right now its been two weeks since my sugery and i just came home from the surgeons office. He was a little concerned about me straightening my leg i'm at -30 degrees and he said i should be at 0. He's giving me 2 weeks to get it straight or else.. i don't know what that means.